The second strongest weapon in my arsenal of teaching materials is my set of picture cards (the first is the songs of course!). These are large (A4) colour printouts of words that I teach the kids. I used to use the pictures from Microsoft Word Clip Art (they are on the CD-ROM or the website!) 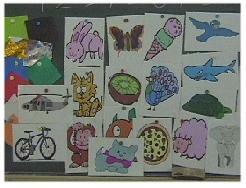 - they are large, colourful, cute and unambiguous, but I now mainly use the free Genki English picture cards. I also have them laminated so they are strong and durable to play games with. It's also really cool to do this in English, the "Rock, Paper, Scissors" song on CD4 is the easiest way to do this! Check out our online Janken as well! This is a great trick I used to use to get everyone to say something in unison. To use it simply say a word (e.g. "Dog") and then "saaaay knoooow" (really long and elongated) and the kids will magically say the word all at the same time! It's a bit like a musical count-in (one, two, three, four or whatever), but it makes teaching new vocab a lot easier when they are all speaking (and more importantly quiet!) at the same time! However after a while it's usually better to get the kids to respond to an English "3, 4!" count-in to completely remove the Japanese element. Whilst it maybe tempting and can sometimes be the easy path, don't use katakana to write out English words. It is one of the major hurdles to Japanese people's English and should be avoided at all costs. Luckily the Ministry of Education also advises against using it in their handbook! All the games in this section have worked brilliantly in my lessons (that's the only criteria for being selected for the homepage). But of course they don't all work all the time. Sometimes they flop completely, sometimes the kids don't get it, or half of the class ends up in the nurse's room (sorry!). If at first you don't succeed try again, sometimes the kids need a few goes to try it out, and then they'll love it!! Also if the Japanese teacher doesn't understand it when you explain before the lesson, don't worry! The kids always pick things up quicker than their teachers!! These game rules are not cast in stone. Most of them have been passed down to me from other people and I've adapted them to suit my needs. You should do the same. Don't be afraid to mix different parts to create new and spicy varieties! Keep things simple, but not too simple! "Never underestimate the pleasure people get when you teach them something they already know" said a very clever man to me once. When teaching new words, use a few words that are similar in the native language (e.g. koala, tomato, banana) as confidence boosters for the kids. I usually teach ten words at a time, 3 or 4 will be the same in Japanese, 3 or 4 normal level words and 1 or 2 will be tricky "challenge" words! If all the words are either too easy or too difficult they'll switch off and get bored. A good blend is the way to go! When planning a new game, or a variation on an old one, then think like a kid. If you were playing the game how would you be able to manipulate the rules to your advantage? If there are any loopholes then invent a rule to stop them! This is one of the biggest reasons that I've dismissed other games - they're too easy to cheat at!! All Japanese kids do a greeting at the beginning of class, get them to do it in English. e.g Stand Up, Bow, "Good Morning", sit down etc. If a kid is happy, moving around and having a good time they'll naturally absorb and remember the English they are learning. If a kid doesn't know a word then don't worry, and DON'T shout at them or make them feel uncomfortable. Help them by saying the beginning of the word, or sometimes whispering in their ear and then getting them to shout it out works (but not always!). Whatever happens, don't make them feel bad, don't just pass over them and ignore them, help them! When they finally say it, whether you helped them or not, they'll feel really good for having achieved something. And remember to praise all the good things they do, e.g. telling them to clap (as a class) when they get some pronunciation good..
Not all the kids are smiling? Teach them the word "smile" and tell them to do it. Go round and check they're all smiling, any kids who are not will soon break down in a fit of laughter! Don't overdo this one though! I've been teaching since I was 16, was a JET for 3 years and now I provide training for thousands of teachers up and down the country and around the World. But I still only know a fraction of what I could know! But I'm always open minded, willing to try new ideas and learn. Be flexible and genki when you teach - enjoy it !